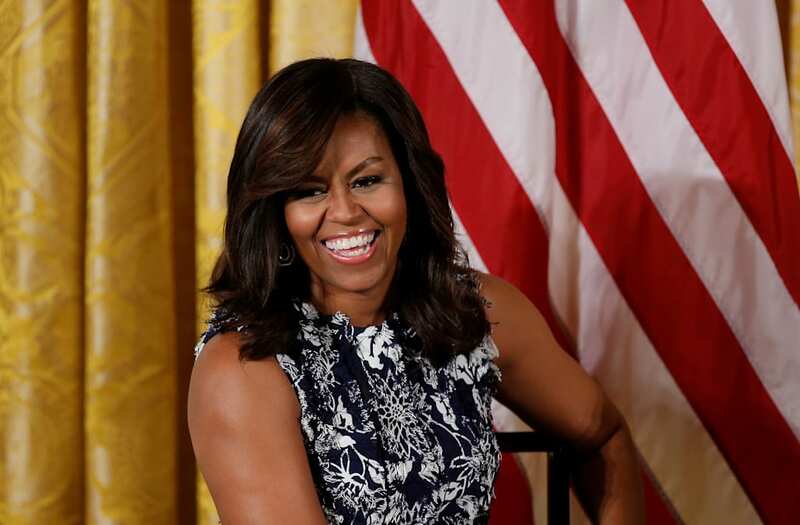 A new book featuring intimate photographs of Michelle Obama will soon be available for purchase across the country. The book, "Chasing Light," will feature 150 images of the former first lady captured by White House photographer Amanda Lucidon, according to the Associated Press. "Mrs. Obama is a source of light and inspiration in my life," photographer Lucidon said in a statement. "She was a mentor to me and so many people around the world. The work she has done with young people, especially girls and underserved youth, has helped me realize that I want to spend my life helping others reach their fullest potential." Another visual collection, "Obama: An Intimate Portrait," including pictures by White House photographer Pete Souza is also set to be released on Nov. 7. In his post-White House career, Souza has taken up the art of topically contrasting photos of Obama with narratives out of the Trump administration. The collection is set for a release date of Oct. 17. After eight years in office, the Obamas headed off on a well-deserved break in January. This 72-acre island — located in the British Virgin Islands — is owned by British entrepreneur Sir Richard Branson. An individual room on the island starts at $4,280 a night, for a week minimum. According to Branson, this was the first time Obama had kite-surfed since his time in office. Branson wrote on his blog that he challenged Obama to a competition to see who could learn how to kite-surf and foil board more quickly. Branson said that inviting the Obamas to his island was "a huge honor," the Associated Press reported. Branson admitted that Obama won the challenge, managing to kite-surf 100 meters on his board. After a quick pit stop in San Jose, California to meet some tech executives, Obama headed to his home state of Hawaii to play a round of golf at Mid Pacific Country Golf Club. He was later spotted dining at laid-back surf-and-turf restaurant Buzz's Lanikai in Kailua. Activities are a big part of the Polynesian experience. Local news station TNTV published photos of Michelle Obama paddle boarding after she joined her husband in French Polynesia. The Obamas then joined Bruce Springsteen, Tom Hanks, and Oprah Winfrey aboard David Geffen's "Rising Sun" yacht off the Island of Moorea in the South Pacific. Obama spent nearly a month in French Polynesia. In May, the Obamas headed to Italy, beginning with a brief stop in Milan, where Barack Obama delivered a sold-out speech at the Food Innovation Summit. The couple went on to Tuscany for a six-day vacation, staying at Borgo Finocchieto, a restored 14th-century village that is now a private hotel. The property is owned by John Phillips, an American who served as US Ambassador to Italy under the Obama administration from 2013 to early 2017. Phillips bought the abandoned village and began renovations in 2001. While vacationing in Tuscany, Michelle Obama was spotted exploring the nearby town of Montalcino. Barack was also pictured playing golf at the Castiglion del Bosco course, a 15-minute drive away from Phillips' property. The couple also managed to sample some of Italy's best food, cooked by world-renowned Italian chef Massimo Bottura at an event hosted by John Phillips. Since their Italian vacation, President Obama has been traveling around Europe on business for the Obama Foundation, Time reported. He was also seen golfing at St. Andrews in Scotland. This June, the Obama family is reportedly staying at the $2,500-a-night Four Seasons hotel in Bali, Indonesia. The whole family was spotted whitewater rafting in the Ayung River. Later, they visited the Tirta Empul temple, which is famed for its holy water. Michelle, Malia, and Sasha donned yellow sarongs for the visit.